alaTest has collected and analyzed 6658 reviews of Apple iPad mini 3 (Late 2014). The average rating for this product is 4.7/5, compared to an average rating of 4.3/5 for other products in the same category for all reviews. Views about the price and portability are generally positive. The size and performance also get good feedback. alaTest has collected and analyzed 297 user reviews of Apple iPad mini 3 (Late 2014) from Amazon.co.uk. The average user rating for this product is 4.8/5, compared to an average user rating of 4.3/5 for other products in the same category on Amazon.co.uk. Views about the screen and design are overall positive. The price and portability also get good comments, but some have doubts about the reliability. alaTest has collected and analyzed 828 user reviews of Apple iPad mini 3 (Late 2014) from Amazon.com. The average user rating for this product is 4.7/5, compared to an average user rating of 4.1/5 for other products in the same category on Amazon.com. Views about the price and usability are on the whole positive. The portability and size are also mentioned favorably. There are some less positive views about the reliability. Comments are divided on the storage. alaTest has collected and analyzed 13 user reviews of Apple iPad mini 3 (Late 2014) from Amazon.ca. The average user rating for this product is 4.6/5, compared to an average user rating of 4.2/5 for other products in the same category on Amazon.ca. Views about the screen and design are on the whole positive. The price and portability are also mentioned favorably. Many are critical about the reliability. This is a fantastic iPad Mini, but it's a terrible deal. We recommend you buy a cheaper 32GB iPad Mini 2 and wait a year to get a fingerprint sensor. The Apple iPad mini 3 is a superb small-screen tablet, but you can get essentially the same experience from its predecessor for $100 less. Pricey. Few reasons to buy over the less-expensive, still-available iPad mini 2. Though we're disappointed by the lack of upgrades, Apple's smaller iPad is still a great choice. Both the display and battery life are excellent, and the addition of Touch ID takes care of our biggest complaint from the previous version. Other than a gold option and Touch ID, the iPad Mini 3 is identical to its predecessor. It lacks the processor and camera upgrade of its big brother, the Air 2, and it's still priced at the high end for midsize tablets. One of 2013's best, the iPad Mini 3 is still a compelling choice despite the lack of upgrades. However, the nearly identical and significantly cheaper iPad Mini 2 is a smarter buy. Excellent app selection; Classy design; Long battery life ; Slower performance than competitors; Soft speakers; Mediocre cameras ; The iPad mini 3 adds Touch ID and a gold color option to Apple's already great small tablet. Slower performance than competitors; Soft speakers; Mediocre cameras ; The iPad mini 3 adds Touch ID and a gold color option to Apple's already great small tablet. The iPad mini 3 adds Touch ID and a gold color option to Apple's already great small tablet. 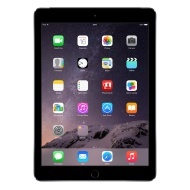 The iPad Mini 3 is a compact iPad with a Retina display and a fast A7 processor. It also now features a Touch ID fingerprint identity sensor for extra security. There's nothing wrong with the iPad Mini 3. It's a lovely device with excellent performance. We just wish that it had moved forward from one year ago.